Convert your media files to Epson portable multimedia players: P-2000, P-3000, P-5000, P-6000 and P-7000. Predefined profile settings have been created for each Epson model. To select media conversion properties for your Epson model, click Formats >> Select Device Profiles >> Epson >> ( Select desired device profile ). This is an example of an Epson P-2000 video device profile. MPEG 4 files are produced when you choose this device profile. The files encoded with XviD Encoder are compatible with almost all the players. The Frame Rate is set to 25 Fps and Bitrate is 1200 Kbps. You can choose to keep the default profile dimensions or change it from the Video Dimensions drop-down menu. Custom dimension settings are available. 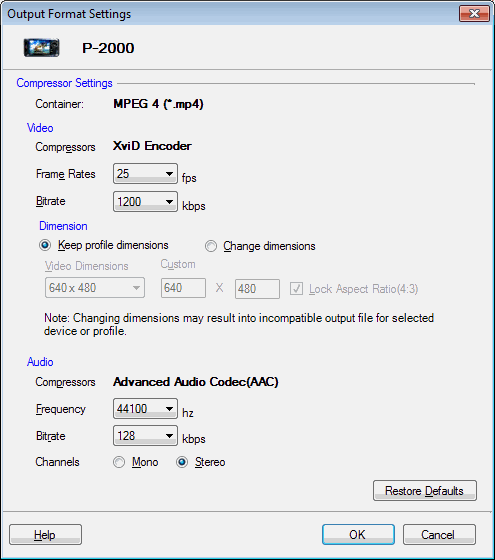 Advanced Audio Codec ( *.AAC ) is the audio compressor that produces higher quality and smaller files. The frequency is set to 44100 Hz, and the bitrate is 128 Kbps. The Stereo audio channel creates an impression of sound heard from various directions. There are two Audio profiles for the Epson devices, Epson AAC Audio and Epson MP3 Audio. This is an example of an Epson MP3Audio device profile. 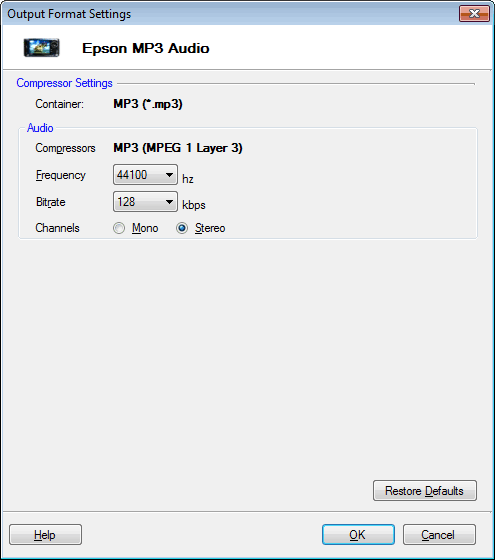 The audio file format and compressor used in Epson AAC Audio profile is Advanced Audio Codec ( *.AAC ), whereas MP3 ( MPEG 1 Layer 3 ) is compressor that is used in Epson MP3 Audio. By default, both the audio profiles have a frequency that is set at 44100 Hz, bitrate at 128 kbps and audio channel on Stereo.